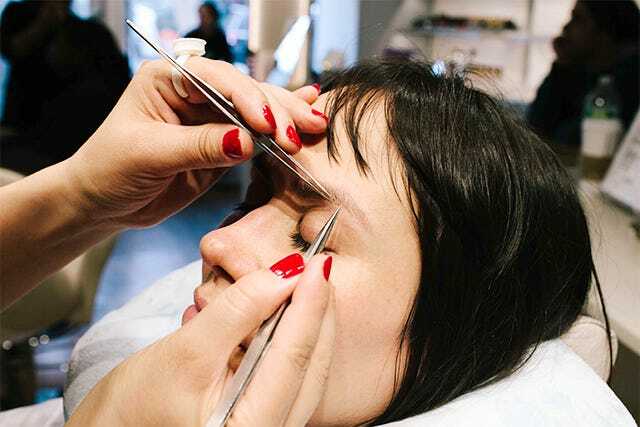 Before I walked into Wink Brow Bar, the full extent of my brow-maintenance routine consisted of a weekly vigorous pluck with my trusty Tweezerman. Having grown up a tomboy with a mother who never wore makeup, I never learned the art of eyebrow shaping (or most other beauty tricks, for that matter). So, my brow know-how (such as it is) was cobbled together piecemeal from YouTube tutorials, and — as hard as this is to admit — a diagram of Kim Kardashian's brows that my friend ripped from a Star magazine in 2007, which we pored over in an attempt to recreate her full-but-defined arches. Needless to say, with this shaky foundation, my brows were not the best. For years, I overplucked myself into skinny '90s arches. When a fuller look came into fashion, I continued to overpluck, because that is the only way I knew, only to repent with a thousand tiny strokes of my Dior Brow Styler (at $29 a pop, this habit may be the sole reason I'm not saving for retirement). So, when our beauty team offered me the chance to get eyebrow extensions, I jumped at it — despite the fact that I had no idea what an eyebrow extension was. Turns out, no one else does either. When I told people I planned on getting them, the general reaction could summed up in two words: "Come again?" The more verbose asked, "Is that an actual thing?" "Are you going to get an eyebrow weave?" "Are your brows gonna be on fleek?" Great questions, all — but I had no answers for any of these. Aside from the instructions to grow out my brows before I arrived, I was going into this blind, albeit with visions of a terrifying eyebrow transplant dancing in my head. Until I walked into Wink. 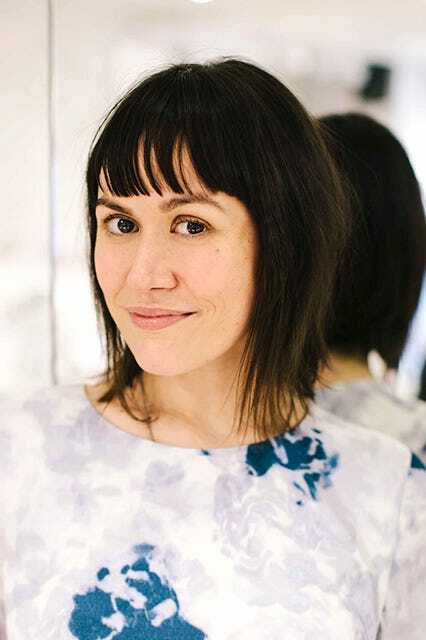 The small, bright salon opened in the West Village in March 2014, and has quickly become a word-of-mouth favorite among New York 's fashion and beauty editor set. Wink offers a full menu of lash and brow-perfecting treatments, from threading and tinting to extensions. First, I sat down with founder and CEO Umbreen Sheikh for a consultation. Umbreen regarded my brows with an expert's appraising eye, like a jeweler peering through a loupe. Held in her wise gaze, I felt compelled to confess my sin: "I overpluck," I said helplessly. Umbreen replied, kindly and definitively: "Yes, dear, you have half a brow — but don't worry, we're going to build you back," and in that moment I knew I was in good hands. Umbreen turned me over to my "Brow Bar Artisan" Temzin, who started with a quick threading. I was shocked to discover this did not hurt at all — there was none of that "can't decide whether to sneeze or cry" feeling you get when plucking an especially thick brow hair. Umbreen explained that the salon uses a proprietary silk thread to ensure painless removal. It made me feel fancy knowing that somewhere, there were silkworms dedicated to helping me achieve my dream brows. Temzin then applied a custom-mixed, vegetable-based dye to my brows, a process I admit I was a bit skeptical about. But, despite the dye's application lending me a certain Bert-like air, I became a believer once it was wiped away. Between the threading and tinting, I already had expertly shaped, surprisingly fuller looking brows (despite the fact that they'd removed hair, which is clearly sorcery). The brow shape and tint together cost $38 and took about 20 minutes — so, if it's bang for your buck and time you're looking for, you could stop here and walk out feeling pretty damned jazzy about yourself. But, I didn't block out my afternoon for nothing. I was determined to conquer my tragic case of SBS (that's Sparse Brow Syndrome, and the struggle is real). And so, I leaned back in my chair as Temzin began the extension process. Her tools were a two-inch strip to which hundreds of tiny, synthetic hairs were attached (they come in hundreds of different shades and lengths to match your natural brow hair), a white plastic ring filled with a skin-safe glue, and a pair of tweezers. 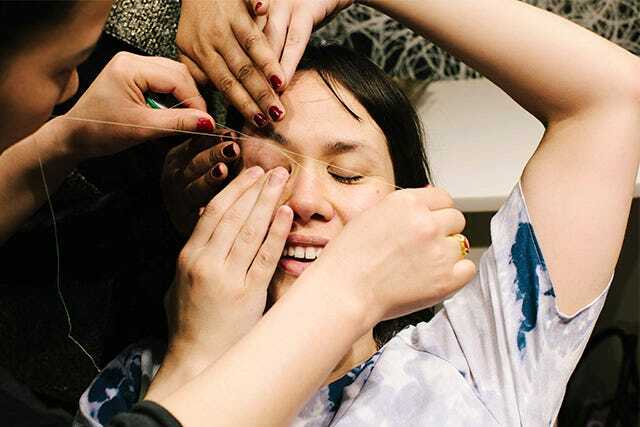 She carefully peeled off one hair at a time, dipped exactly one-10th of it into the glue, and applied each one either to my existing brow hair, or to my bare skin, stopping to check the shape every so often. A complete set of brand-new brows like I received costs $250 and can take up to two hours, but less extensive fill-ins take less time and range from $40 to $185. When I finally sat up in my seat and regarded the finished product, a chorus of angels sang and somewhere, Diana Ross' "I'm Coming Out" began to play. Okay, not really, but the finished result was impressive. I had the perfect shape, Brooke Shields-worthy fullness, and my face felt defined as it never had before. It occurred to me that someone like me — with a fuller face — needs full brows to match. My former skimpy arches and homemade fill-in attempts were not doing a thing for me. The result was enough to make a girl speechless and verklempt — a response Umbreen says she'd seen before. "What did I tell you?" she asked, smiling. 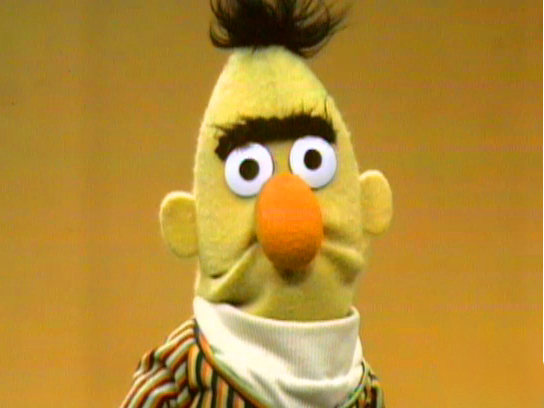 "We never get a brow wrong." Indeed, with my SBS behind me, I felt pretty damn right. Up close, the work looked just as good — you can't see the glue at all, or detect a difference between the synthetic and natural hairs. 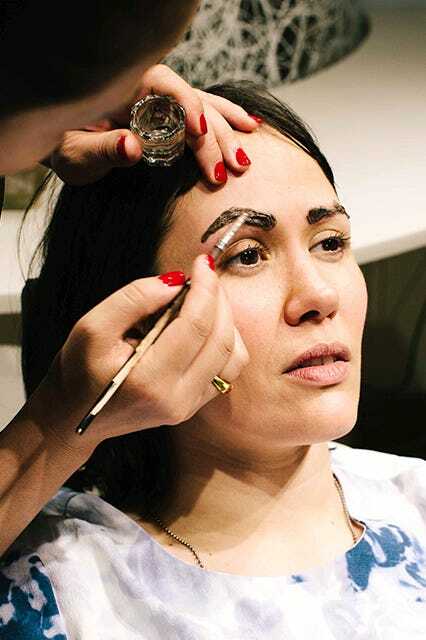 Aftercare was simple: Leave your brows be (no water or scrubbing) for 24 hours while the glue fully sets. Admittedly, I took greater than necessary pains: For the first two days, I treated my brows like two little Gizmos — convinced any water would mean immediate disaster. When I finally broke down and washed my face like a normal person, I was pleased to see it didn't affect my extensions. It's now two weeks later, and I'm pretty impressed with how long this has lasted. Extensions are meant to gradually shed or fall out on their own, and generally last about three weeks before you need a refill. As expected, my brows are beginning to look a bit less full, but I just fill in with a powder, and it doesn't take much to boost me back to that full-browed goddess look. And, I'm happy with the response my new brows have gotten. My beauty editor friends complimented me, and my sister was jealous — I mean, really, what more could you ask for? While extensions are most certainly a #treatyoself situation, I've become 100% convinced that, for special occasions or if your look really needs a boost, it pays to put yourself in the hands of a professional. On my way out of Wink, I promised Umbreen I'd give my poor, abused follicles a rest in-between visits, and only see her salon for my brow needs, a promise I was happy to make. I'm not going to toss my Tweezermans, exactly. But, I can say that my usual late-night brow DIYs are a lot less tempting when I know there are pros out there who do it a hundred times better than I ever could. I'm going back tonight for a quick shape-up: "We never get a brow wrong" is too good to resist.